Metropolitan Utilities District takes pride in its public water system and long-range planning which allows it to serve customers’ needs in the metro Omaha area. 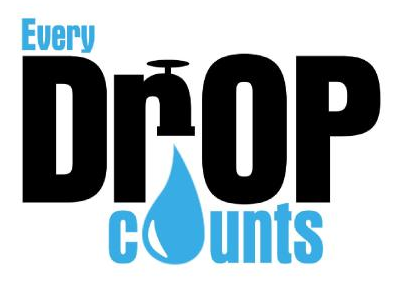 Recognizing that water is a precious resource, the District has a Water Conservation Plan to promote the wise use of water through public education programs, rate structure and operating plans, and to assure customers receive safe water in sufficient quantity and quality to serve their needs. Wise water use messages on customer bill statements, newsletters and new customer booklets. Employee Speakers Bureau water and energy conservation presentations, reaching 200,000 members of the community each year through community events, civic groups, schools, and water plant tours. A water conservation section on our website which includes wise water use tips and links to helpful resources. A wise water use flower garden at the Village Pointe Shopping Center in conjunction with the UNL Extension Office and Master Gardeners. Participation in the Annual “Eyes on Conservation” Water Festival, held at Schramm Park. The Festival attracts approximately 1,600 fifth grade students. Inspect all pipes and faucets for leaks. Make necessary repairs. If every household in America had a faucet that dripped once each second, we would waste 928 million gallons of water a day or enough to fill 7.5 billion 8 oz. glasses. Check toilets for hidden leaks. Tank-to-bowl leaks can waste about a quart of water with each flush. Place a few drops of food coloring in the tank. Wait 15 minutes. If the color appears in the bowl, you have a leak. Make necessary repairs. Water every other day, unless you have new sod. Water in the early morning, 4 to 10 a.m., to allow grass blades to dry, making them less susceptible to foliar diseases. Watering is more efficient in the morning due to less evaporation and wind speed. Don't water if it's windy. Measure the amount of water applied to your lawn in a 15-minute period using collection devices such as a tuna or coffee can. Adjust the run time on your sprinkler system to deliver the required amount. Contact a lawn care professional if you need help. When watering on a slope, use "delayed starts." Run your sprinkler until you notice runoff, then stop. Wait three hours, then resume. Aerate every year or so to increase infiltration. Observe your sprinkler system once a month. Look for heads that don't turn, heads that spray the street or sidewalk, bent or damaged heads, clogged or worn nozzles or orifices, turf growth around heads that impede water delivery, compaction and run-off. Adjust heads as landscape plants grow larger and begin to block the spray pattern. New installations of benches, decks, etc., also can decrease irrigation efficiency. During hot weather, run your sprinklers 5 to 10 minutes per zone to cool the turf and reduce stress. This is called syringing, and it reduces the symptoms of summer patch disease. Create water zones by putting plants with similar water needs together. Ornamental plants can be grouped into low, moderate and high water users. Each zone of plants can be irrigated according to its needs. Focus on growing drought-tolerant plants. Once established, a number of beautiful plants, native and non-native, can survive with less than an inch of water a week. Keep weeds out of flower and vegetable gardens. Weeds steal water away from other plants. Adjust sprinklers to aim water directly at plants rather than sidewalks, paths, driveways, or fences. Use sprinklers that emit large droplets, again to reduce losses due to evaporation. On automatic sprinkler systems, install a moisture sensor--a probe placed in the ground that determines when the soil needs water and turns on the sprinkler. Install drip-irrigation systems and soaker hoses in flower and vegetable gardens, around trees and shrubs, and containers. Mulch to slow evaporation of moisture from the soil and keep the soil cool. Mulches should be applied no deeper than 3-4 inches. Excessively deep mulches will stimulate root growth in the mulch layer. These roots are more likely to experience winter and drought injury than those growing in soil. Stay with organic mulches, which slowly break down and add organic matter to the soil. Capture and recycle rainwater by placing barrels or buckets beneath your downspouts. Use it to water your lawn and landscape plants. Check hose connections for leaks, and repair them quickly. When you use a hose, attach a hose nozzle that can be shut off when not in use. A single hose left on uses nearly 300 gallons of water an hour. In hot, dry weather, use a broom instead of water to clean patios, sidewalks and driveways. Know your soil's water needs. Clay soils require slow watering. They dry out slowly and need infrequent watering. Sandy soils dry out quickly and require more frequent watering. Improve the soil to hold more water and oxygen by adding organic matter. Mix grass clippings and leaves into flower beds, vegetable gardens or newly-worked soil. Start a compost pile to recycle yard waste back to the garden. 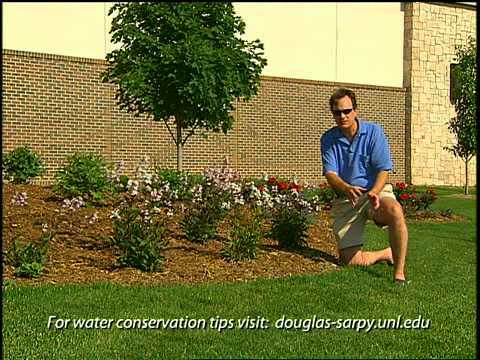 Reduce fertilization unless you're applying enough water to keep plants growing vigorously. Heavy fertilizer applications make lawns require more water or the high salts may burn plants.